Who Is The Real John William Harvey? Who is the real John William Harvey? Is he the highly decorated ex-CIA officer, doctor and U.S. Army four star general like he had claimed to neighbors living in his trailer park? Or was he really just a dirty 70-year-old man attracted to little boys who had been posing as a multitude of highly respected professions to gain his victim's trust? Well nobody knows quite for sure at this point. The only thing that is certain regarding John Harvey is that Fayette County Georgia police have recently arrested and charged him with nine counts of child molestation, one count of aggravated child molestation, eight counts of enticing a child for indecent purposes, and one count of furnishing alcohol to minors. That's quite a lot of nasty for a four-star general if you ask me. Of course the first tip-off of insanity here is the fact that a self-proclaimed doctor who had been employed by the CIA could not possibly be living in a trailer park. Unless of course, he has a bad gambling problem or had been severely addicted to drugs. No, I bet Harvey never belonged to or obtained any of those highly regarded positions in his entire life. In fact, I bet he schemed the whole thing up over time just to gain his neighbors trust to have access to their young children. Heck, even if the adults didn't believe him, what's the big deal? He is after all just a harmless old man who's probably in his first stages of dementia. Regardless, I'm pretty damn sure police had plenty of evidence to back up the child's claim that he had been molested by Harvey over a one year period when they went and arrested him on November 7th. Kinda scary really, because investigators also fear there may be more victims out there that they don't know about as of yet. Now let's go to his MySpace profile class and find out a little bit more about 70-year-old accused child molesting four star general, Dr. John William Harvey. Solid, well rounded and educated, outgoing, compassionate, careing,stabel,trustworthy,with a verity of interests. The key words there being "trustworthy" and "educated", but perhaps though he should be given a pass on the latter as he was likely intoxicated when he shamelessly butchered the English language. Enjoy History,Sports, Aarcheology,Pysics, Science, Medicine, Militaey Stratagy abd History, I enjoy the The company of family friends and young people esspecially young guys. Teens to twenties. Eager beaver old man Harvey puts an emphasis on "young". He actually later narrows the age specifically to 16. 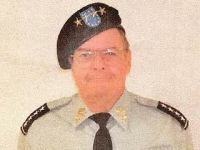 The 70-year-old also confirms on his MySpace the delusion or scheme that he's a high ranking military officer and you can check all that out by clicking his above picture which will you take to his MySpace profile. I really wish I could stop writing that, but I fear I never will. Anyway, the Fayette County Sheriff’s Office is asking anyone with information on John Harvey to contact them at 770-716-4777.